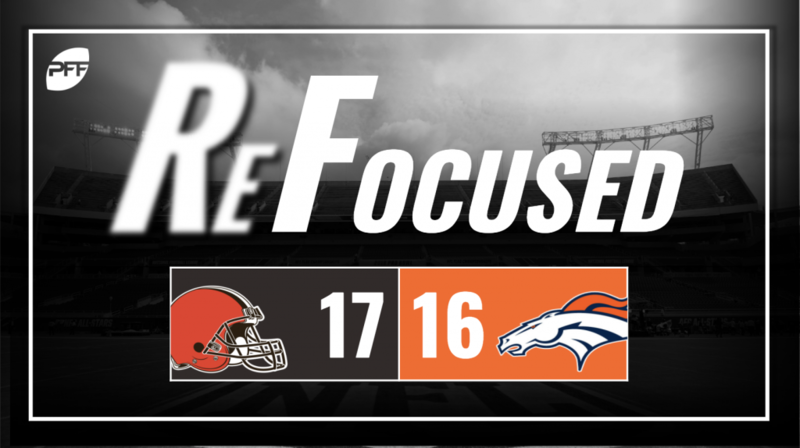 The Cleveland Browns defeated the Denver Broncos, 17-16, in Week 15 of the 2018 NFL season. Baker Mayfield started the game off well with a beautifully thrown corner route for a touchdown on their opening drive. But his accuracy waned for the remainder of the first half, leading to an interception thrown inside the red zone at the end of the half. He turned it around enough in the second half to lead the Browns to take the lead early in the fourth quarter, but it was still his lowest completion percentage since Week 6. Nick Chubb hit the 100-rushing yard mark for the third time this season and largely had to overcome subpar blocking to do so. Most of the time he wasn’t given all that much room to work with. His ability to create a couple big runs, including a 40-yarder to start off their final drive, inflated the effectiveness of an otherwise mediocre rushing attack before that final drive. Safety Jabrill Peppers has been overlooked for most of the season because of the play of Damarious Randall and Denzel Ward, but Peppers has had a strong 2018 campaign. Against Denver, he easily had the best game of his young career, tracking down an underthrown end-zone pass for an interception and racking up two sacks with one resulting in a game-winner. To top it all off, he was one of the few Browns defenders to not miss a tackle. Outside of Peppers, there wasn’t a single defender that stood out in an impactful way. Myles Garrett had a few splash rushes but wasn’t able to consistently generate pressure. The biggest takeaway from the Browns’ defense was they were excellent as a unit defending the run and terrible tackling in coverage when passes were thrown short. Head coach Vance Joseph asked QB Case Keenum to be more aggressive and throw it downfield during the week leading up to the game. The problem with that advice is Keenum was at his best throwing it short and letting his playmakers make the Browns’ defenders miss tackles. He missed on all five on his attempts over 20 yards including both of his interceptions. The Broncos’ formula for winning this season was to run the ball effectively and not make Keenum win it for you. The problem with this is teams can flood the box for the run and even Phillip Lindsay will have bad days. With Chris Harris Jr. out, Jamar Taylor getting ejected and Bradley Roby on the sidelines for a bit dealing with an injury, more pressure was put on safety Justin Simmons to step up. Simmons already moves around in the Denver defense quite a bit, but he was forced into the slot and outside corner roles a bit more than normal. He didn’t fare that well in coverage and allowed what ended up being the game-winning touchdown on a slant to Antonio Callaway. Von Miller got one sack on the day to become the Broncos’ franchise sack leader. But otherwise, Denver did not get as much pressure on Mayfield as they would have liked. Mayfield bounced back from a poor first half to help the Browns do just enough to seal the win and keep their playoff hopes alive for at least another day. Peppers was the star of the game, as he made arguably the two biggest plays of the game. Keenum had the ball in his hands with a chance to get into field goal range, but he wasn’t able to bounce back from his game long struggles lead the Broncos to victory.